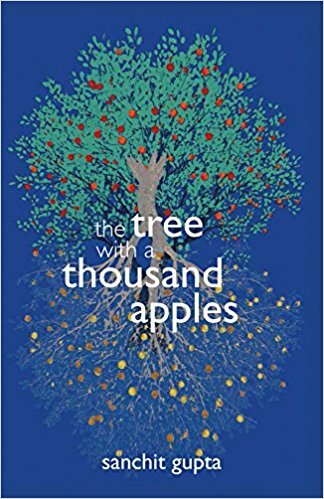 You’d pick up The Tree with a Thousand Apples by Sanchit Gupta simply because of the stunning cover art by Misha Oberoi. It helps that the cover has a sticker that announces that the script based on the book is longlisted at the Sundance International Screenwriters’ Lab 2017. But also, you can’t wait to get embroiled in Kashmir. There are too many displaced Kashmiri poets in town and you want to know more about a book that talks about the tormented land. For the first sixty pages or so, you will be impatient. The introduction to the characters, Bilal, Deewan and Safeena goes on and on. You get no feel for the colours of the Chinars, you don’t shiver from the cold breezes, you don’t picture the wooden homes, their creaking stairs. You only understand that the Bhats and the Maliks are neighbours, you understand how Deewan can fight for Bilal, and that Safeena is beautiful and that her tears are like diamonds and emeralds. The story takes its own sweet time to take shape, and that could be a negative for the book. But then the action begins and the Bhats have to hide in their neighbour’s home from the burning and the pillaging. It is here that you begin to worry, to care for the characters. You realise how young they are and how the innocence of the city is systematically torn apart. Shahnaz Bashir was born and brought up in Kashmir. His widely reviewed and critically lauded debut novel The Half Mother won the Muse India Young Writer Award 2015. His short fiction, memoir essays, poetry and reportage have been widely published and anthologised. Shahnaz teaches narrative journalism and conflict reporting at the Central University of Kashmir, Srinagar. He is a university gold medalist in journalism and was also awarded the prestigious Shamim Ahmad Shamim Memorial Kashmir Times Award 2007. His second book Scattered Souls, a collection of interlinked stories, has just been published by Fourth Estate HarperCollins. He is currently working on his third book. Shahnaz Bashir’s two evocative poems on Kashmir’s present where stones write the elegy of loss and newspapers announce news of more massacres yet speak of an undying hope. On the streets and lanes and by-lanes of a paper. Detritus of truth, the alphabets of stones. Battered words that distort even the stones. They shatter the hearts of stones. Tears of stones, blood of stones. In the memory of stones. In each hand that smells of freedom.